"what you love might kill you" when you are a boy that saying doesn't mean anything, that is unless you like marshmallows. When I was between 5 or 6 years old I used to go with my Dad (my superman) everywhere, by then He was working for a news paper, (no, sorry, I don't remember the name of the paper) and we traveled a lot and we used to stay in a very nice places: hotels, bungalows, and even resorts. This story took place precisely in one of the most well known resorts in the Morelos state, Oaxtepec. I loved being with my Dad, aside from the fact that wherever he took me I could have anything I wanted, and some of that was called "marshmallows", those little, soft, sweet, and very good to eat (at least back then) were my "love" I liked them so much that the saying that I mentioned at the beginning of this story had at that moment some meaning to me. In one occasion, while my Dad was playing cards with the hotel administrator and some other people, I was playing with my little friends outside of the hotel including the daughter of the hotel administrator. My Dad called me and he asked me to buy him some cigarettes (yes, back over there parents used to send their kids for anything: beer, cigarettes, matches, you name it) and that day my Dad gave me a $5 pesos bill (don't change that to dollars, please) which back then that was a lot of money, specially for a kid like me. So I went and got his cigarettes and when I was giving him the change I asked him "hey Dad, can I keep the change?" At that time I didn't realize that my Dad's response was based on the focus that he had on his card game and it was almost automatic, "yes, yes, that's fine!" that day stayed in my mind for two reasons. One, because I ate marshmallows like there was not tomorrow, bought marshmallows to all my little friends that were playing with me, including the daughter of the hotel administrator, and two, because, later after my Dad has finished playing cards (and after his mind and eyes were off the playing table) he came up to me and asked me for his $ 5 pesos bill change!! Unbelievable!! I mean, I could be presumably short minded, or with lack of memory retention, but not even an hour had passed and my Dad already forgot that he allowed me to keep that change!! (unless he meant, keep it for me for later, in which case I would have to rewrite this story) I got the (beating) spanking of my life!! 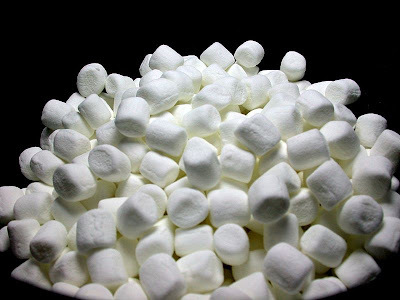 and I owed it to my beloved marshmallows. And there it is, "what you love, might kill you", My Dad tried to make the situation softer by telling me that, that was a lot of money, that he didn't mean to hurt me, that. .. . . He went on, and on, but in my little fragile mind, I could not assimilate why I got punished, just because I asked for something (to keep the change) and that my happiness for eating so many marshmallows had to have so cruel end. Today I still eat a lot of marshmallows and I guess the difference is that I'm not getting spanked for it, anyway, I hope that all of you liked this story, for those that did not, don't worry, your story is coming soon, for the moment stayed safe, if you drink don't drive, and if you drive, stay out of my way! !, until the next story, you'll read me later, over n' out.